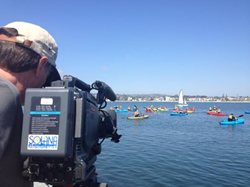 Solana Productions’ San Diego video production services include camera crews for Corporate, Broadcast and Live Events. For over 20 years our talented pros have covered everything from Comic Con craziness for Warner Brothers to world wide webcasts for HP. We’ve received Emmy awards for producing, writing, photography and editing. We have very low overhead and tailor crew and camera packages exactly to the client’s demands. 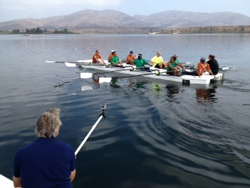 This lower production cost for San Diego video production is passed along to clients. Story production for these shows is generally done with a crew of from one to three people. The simplest projects can be done with a camera operator who also records interviews with a wireless, or hardwired mic attached to the camera. More common is a crew of two with an Audio Tech and field mixer feeding the camera. Even though the day rate for this addition is higher, clients can often realize savings as the production work is done much more quickly with two people. Higher profile shows demanding a look for their San Diego video production that sets them apart will often budget for the addition of a lighting crew. This would include a Gaffer (lighting director), Grip (helper) and a Grip Truck. Costs for this depending on the size and intricacy of the lighting required. Most two camera interviews will use the smallest, a van or 3 – 5 ton grip truck, while more involved productions could require the use of 10 ton trucks. Need an interview / b-roll shot? Webcast? Meeting coverage? We can help. Our crews dress appropriately, show up ahead of time and redefine customer service. We can provide video, audio, projection and staging with one phone call. For an amount that’s sure to surprise you we can provide booth coverage and a finished, narrated video. Don’t rely on amateurs when our professional can capture events on video that you’ll have uses for in the future. Solana Productions has extensive editing experience, winning Emmys for magazine shows and sports stories. We can also provide editing on location giving you a head start on those deadlines. We use both Final Cut Pro and Avid systems depending on the client’s preference. A free loaner hard drive is also available if you edit on your own. San Diego County is one of the most production friendly areas in the country. We’ve been shooting here for over fifteen years and are still occasionally surprised by the varied locations. Within an easy drive you can find miles of coastline, mountains and desert. Each of these locations offers great opportunity to make your video production outstanding. This could mean the beaches of Del Mar or Coronado, the cliffs of Torrey Pines State Park or the protected waters of La Jolla Cove. Various shoots over the years have taken us to many of these locations. One production for Toyota involved moving trucks onto the beach in the City of Del Mar in northern San Diego County. We followed Tiger Woods around the magnificent Torrey Pines golf course for a private round prior to the PGA Championship. The course is perched on bluffs overlooking the beach. The mountains just east of San Diego stood in for Montana in a recent production. We shot part of a story for National Geographic about a father and daughter who survived a bear attack. And the deserts a bit further east were a stark contrast for the sleek new offerings from Ford. The video was used to promote their new models during the Detroit Auto Show. The permitting process for San Diego video production is much simpler than what you find in cities like Los Angeles. It can get a little confusing as San Diego County is a collection of many incorporated cities with their own rules. We have extensive experience with the process. We can obtain permits for your production or you can follow the links below. Our San Diego video production team stormed the desert again as Hollywood's A-list swept in for a night of glitz, glamour and awards at the Palm Springs International Film Festival Gala. It's the 13th year our San Diego video crews and San Diego producer have covered the event, where we we're always first on the red carpet and exclusive backstage. After shooting arrival interviews, our two crews moved inside the gala to light and shoot Mary Hart's exclusive one-on-ones with Julia Roberts, Sandra Bullock, Tom Hanks, Matthew McConaghey, Bradley Cooper, Meryl Streep, Bruce Dern and other potential Oscar nominees for "Entertainment Tonight." Another of our San Diego crews shot red carpet arrivals for TV's "The Insider," and handled the show's coverage of the film festival's star-studded brunch the next day.